Heat, serve, freeze, and transport in these toxin-free, reusable containers that combine the best of glass and plastic storage containers. Shatter- and heat-resistant borosilicate glass is encased in a protective, multifunctional silicone sleeve. It forms an air cushion that helps protect the glass if you drop it. The dual seal lid forms an almost airtight lock over the glass and the sleeve. To help identify what’s inside, write on the silicone with a dry erase marker, then simply wash it off. Dimensions: 7.25" x 7.25" x 2.5"
Use it all the time. I wish there were other sizes. 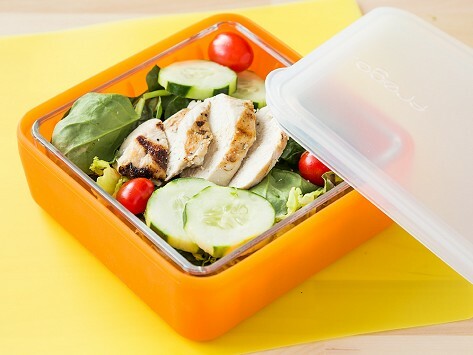 Frego is a big upgrade from your traditional plastic food container: a heat- and shatter-resistant borosilicate glass container that’s encased in a shock-absorbing silicone sleeve. The glass storage containers are made to withstand temperature changes without breaking (take it from the freezer to the oven—no problem) and the silicone protects the glass and keeps it from burning your hands. This was one of those products that made us think: why hasn’t anyone thought of this before now? Mom Juhi Gupta Gulati thought of it because she wanted a safe and environmentally friendly way to pack her child's school lunch. She couldn’t find one, so she decided to make one herself. So what makes Frego great? It is made without toxins—no BPA, PVC, lead, or Polystyrene—so there is no need to worry about chemicals leaching into your food. Plus, the revolutionary lid makes an airtight seal over both the glass and the sleeve, which prevents spills and spoilage. Frego is dishwasher safe and the silicone sleeve forms an air cushion around the glass that makes it incredibly break resistant. The grippy sleeve also helps keep your Frego container from sliding out of your hands or off the table. Another great feature: you can use a dry erase marker to temporarily write on the silicone sleeve. Write your kid’s name, the dish inside, whatever—then simply wash it off. 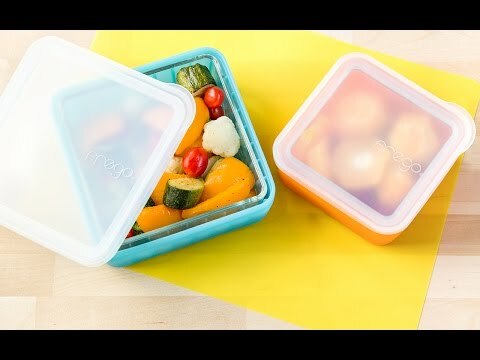 Frego is an all-around better way to store, reheat, serve, and transport your food.